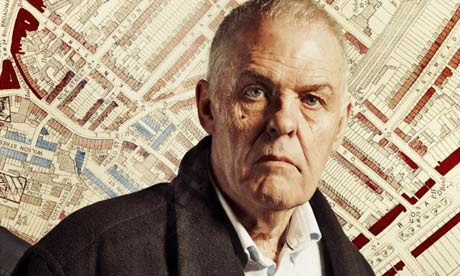 Following rapid growth and a chronic lack of new development, housing affordability has reached crisis levels in London. Median house prices are at £300k (8 times median household income) while average prices have passed half a million. 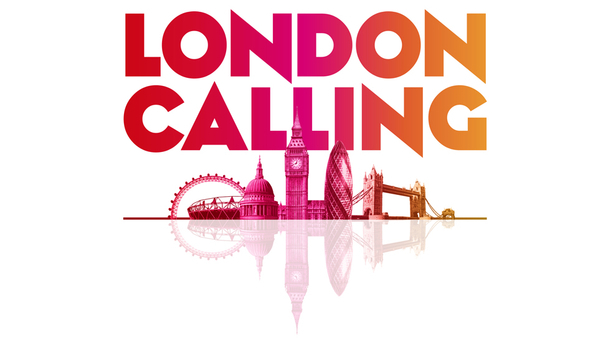 London is now amongst the most expensive cities in the world, a situation with severe consequences for economic competitiveness and for inequality. Rents continue to increase faster than wages, ownership is being restricted to affluent populations and the social housing waiting list now stands at 345,000 households, nearly double the figure from 15 years ago. Recent development figures have been very low. London needs at least 50,000 new homes per year to meet demand, yet only 21,000 were built last financial year, and this figure has been below 20,000 for all of the last five years. Nationally around 200,000 houses a year are needed, and we are building around 100,000. These figures amount to a comprehensive failure of national and mayoral policy. Clearly substantial changes are needed. Last week the Centre for Cities outlined how this change could happen, launching their ‘Building Change: Delivering Homes Where we Need Them‘ report. It convincingly argues that we are failing to deliver homes where demand in greatest- in the vicinity of rapidly growing towns and cities- resulting in spiralling housing costs. The report makes a range of positive recommendations for enhancing local authority capacity in relation to delivering new housing, including the streamlining and reform of compulsory purchase orders for faster development and allowing cities to benefit from uplift values in land; allowing local authorities to borrow more with longer term commitments from central government; and enabling greater cooperation between local authorities to tackle city-region challenges. Best practice examples are provided from local authorities that have successfully delivered new housing, such as Bristol and Milton Keynes. The report also provides a useful summary on brownfield capacity, with for example the potential for 350,000 homes on brownfield sites within the GLA. By far the most politically controversial aspect of the report is the recommendation to reconsider greenbelt development restrictions. Prioritising brownfield land has been a central foundation of compact city planning over the last twenty years, directing development towards inner city regeneration and away from rural areas. Yet brownfield land can be expensive to develop, and in combination with greenbelt restrictions, land prices have soared. These spiralling land costs have significantly curtailed new housing. 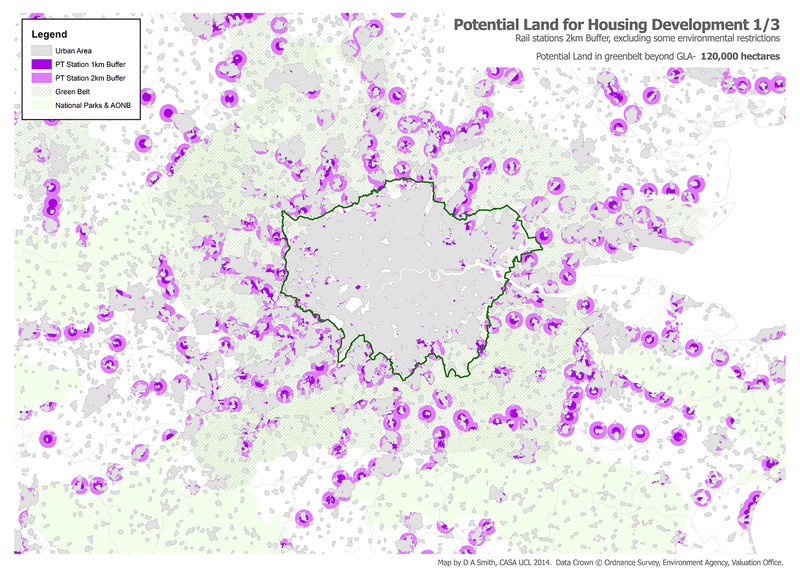 Opportunities for housing on ‘Usable Greenbelt Land’ around London are mapped in the report (figure below), based on locations within 2km of rail stations. 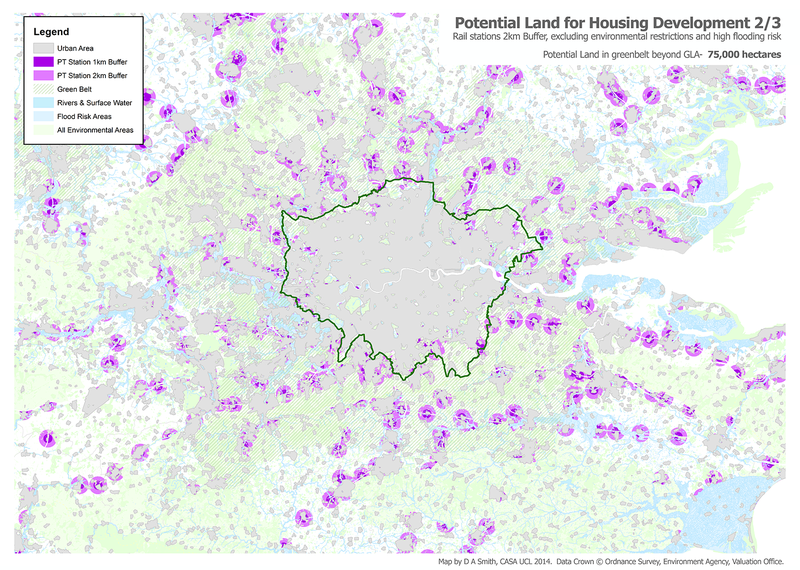 The Centre for Cities estimate that there are opportunities for 430,000 housing units on greenbelt land within the GLA, and opportunities for a massive 3 million housing units on the London greenbelt beyond the GLA boundary. This huge housing capacity could effectively solve London and the South East’s housing crisis. So is developing on the greenbelt the answer? 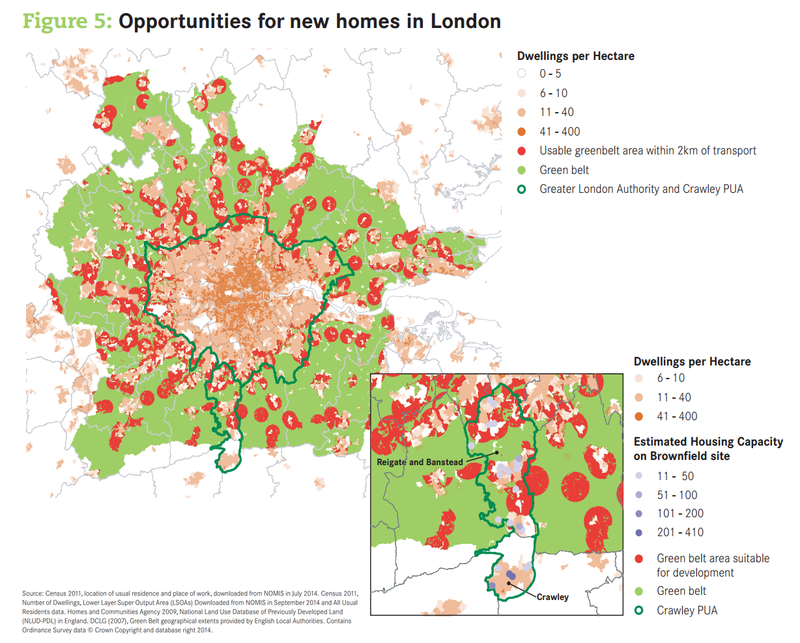 Opportunities for new housing on London greenbelt land, Centre for Cities Delivering Change Report 2014. The gigantic housing development capacity figures quoted in the Centre for Cities report certainly demand attention. 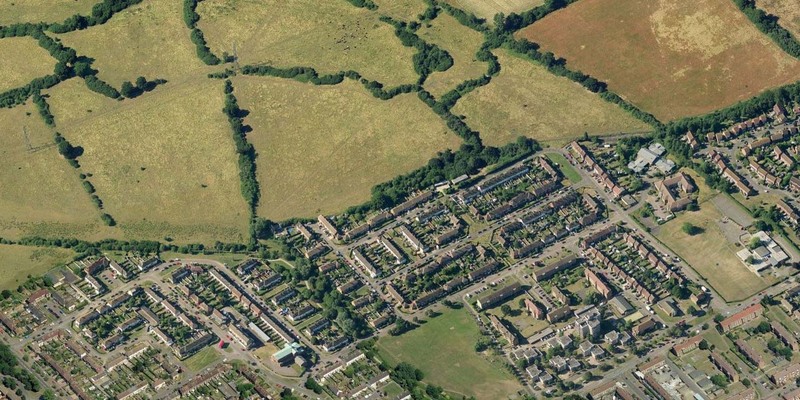 As housing development is such a central issue for planning in the South East, I have decided to repeat the Centre for Cities spatial analysis from a sustainable urbanism perspective and assess how realistic these recommendations are, and what the environmental consequences of the greenbelt development approach are likely to be. First of all, some details on the Centre for Cities methodology. Their Usable Land definition is a 2km crow-flies buffer of rail and underground stations, excluding several environmental protection area types (SSSIs, AONB, SAC, SPA, Ancient Woodlands). The report does not argue that all this land should be developed, rather that it could be considered for development on a case by case basis. They take a ballpark figure that, given infrastructure, services and removing highly amenable land, 60% of the remaining land could be developed for housing at an overall average of 40 dwellings per hectare (thus each hectare of usable land effectively translates to 24 homes). I have repeated this method below and I get a very similar result of 120,000 hectares / 2.87 million homes on London greenbelt land beyond the GLA boundary. 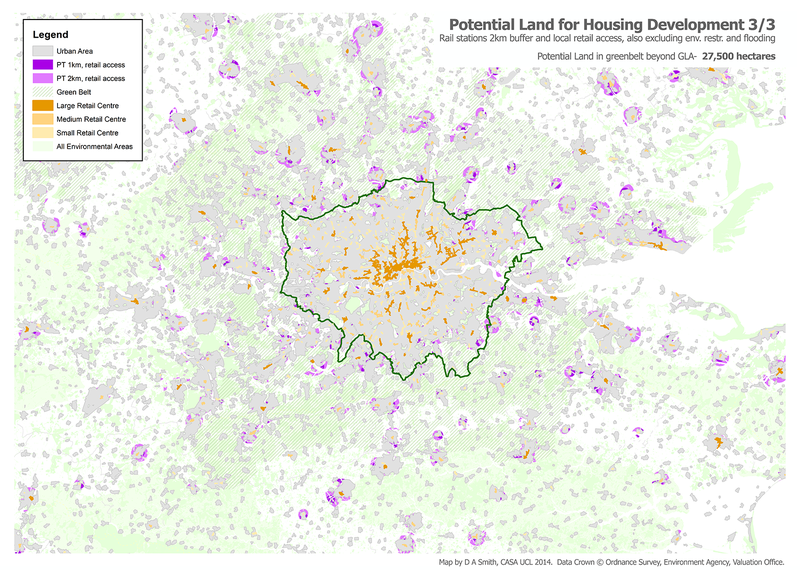 I get a lower (but still substantial) figure of 12,700 hectares / 306,000 homes on greenbelt land within the GLA. There are two main spatial analysis issues with the Centre for Cities method of identifying usable land- firstly there are significant development restrictions missing, and secondly there are problems with using rail station buffers as a proxy for sustainable travel. Regarding the first problem, the most significant restrictions that should be included are flood risk areas, and additional environmental land and habitats (principally Priority Habitat Areas). The impact of these additional restrictions is shown in the map below. Surface water and flooding risk in particular covers large areas of land in the Thames Valley west of the GLA, and north in the Lee Valley, reflecting the role of the greenbelt in flood management. Assuming these areas would not be developed, this removes nearly 40% of the usable land from the analysis, leaving 75,000 hectares. With more data and time, further restrictions could be considered, for example local site access, road congestion, airport flight paths, heritage restrictions etc. The second problem is how to consider public transport accessibility and sustainable travel. The basic principal used by Centre for Cities is sound- directing development to areas of public transport access. But locations within 2km of rail stations in the South East are often very small towns and villages, lacking local retail and services opportunities. Not surprisingly these small towns are generally highly car dependent, with around 80% of commuters driving to work, and similar patterns for other trip purposes. Building further low density housing in these locations would likely reproduce this pattern of car dependence. Ideally the appropriate method here would be to do some accessibility modelling and network analysis (comparable to the PTAL approach used in the London Plan) to identify locations with access to local services and a range of public transport options. Unfortunately performing accessibility modelling for the whole of the South East is not trivial. The maps below shows a simpler alternative, identifying locations within an estimated local walk/bus trip of a retail and service centre (3km of a large centre, 2km of a medium centre or 1km of a small centre) based on 2010 Valuation Office data, in addition to the 2km buffer of rail stations. It is clear that a stricter definition of accessible locations greatly reduces the resulting volume of usable land, directing potential development to larger settlements with more facilities (and public transport services) like Southend, Maidstone and Hemel Hempstead. In this case it leaves 27,500 hectares of greenbelt land beyond the GLA, or 23% of the original figure. Note we also haven’t considered public transport capacity, which is a critical issue for commuters into London as many services are overcrowded. This analysis points to the Centre for Cities figure of 3 million potential homes in the greenbelt being a big overestimate if sustainable planning guidance is going to be followed. Yet even with this stricter approach I still get a large figure of 27,500 hectares of potential development land in the greenbelt beyond the GLA, which would be about 650,000 homes at suburban densities or more at higher densities. This could go a long way to alleviating the housing crisis in the South East. The Centre for Cities report is convincing in its wider policy argument that land should be ‘evaluated on its merits’ rather than being fixed by blanket restrictions. Greenbelt development could play an important and perhaps even relatively sustainable role in addressing the housing crisis. The question then is how any release of greenbelt land can be managed to prevent sprawl and retain the many environmental roles that the greenbelt embodies. There is also the problem of making the case to the public when the greenbelt has traditionally been a popular policy. And so we come back to the issue of local authorities cooperating to tackle regional challenges. A million commuters cross the GLA boundary every weekday, yet regional planning is almost non-existent. Any release of greenbelt land needs to be considered in its regional context and balanced against brownfield opportunities. The biggest housing opportunities are linked to new infrastructure (e.g. Crossrail both West and East of the GLA; the Varsity Line for Oxford-Milton Keynes-Cambridge), again at the regional scale. Its hard to see how the housing crisis can be tackled without much greater regional cooperation and some form of regional planning for the South East.